I haven’t posted here for a while – it’s been a busy year which has seen me move off the Isle of Wight to sunny Southsea. I’ve been busy settling in and exploring my new home town. Here’s one of the great things I have discovered. I hope to share more with you in the coming months. 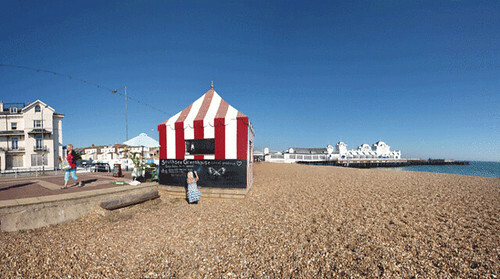 At the end of September I jumped on my bike one day and cycled down to the little red and white striped hut that sits on the promenade right by South Parade Pier – The Southsea Greenhouse. Yes I did say it’s red and white striped, not green, but ‘green’ is very much at the heart of this fabulous co-operative. 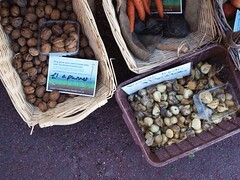 To begin with, it sells ‘greens’ – locally produced fruit and vegetables, in season and with a low carbon footprint. Locally grown plants adorn the outside and inside of the hut, and there’s plenty more to look at with an array of items from local artists and designers. If you’re lucky you might meet one of them helping to run the place for the day. 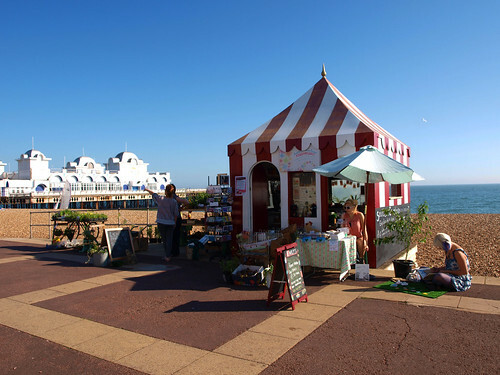 It is the brainchild of Sue Stokes who persuaded the Seafront Manager to let her set up the stall which she runs with a small team of volunteers, many of whom have produce of their own to offer – jewellery, paintings, cupcakes, and much more. When I arrived the sun was beating down on the little hut and there wasn’t a cloud in the sky. The late autumn heatwave was at its height (hard to believe now) and Southsea was bustling with dog walkers, cyclists, parents out with their babies and toddlers, and people who had just come out to sit and soak it all up. 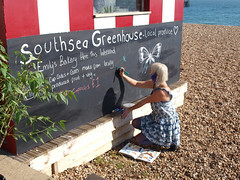 In the centre of all this was a little huddle of activity, chatter and laughter – The Southsea Greenhouse. I started chatting with Sue and she introduced me to Emily (Emily’s Bakery) and Kendal (Eyecandy by Seaslugger) who were both helping out. Emily was keeping a watchful eye on some amazingly delicious looking cupcakes and Kendal was adding some artistic touches to the chalkboard on the side of the hut while her striking hama bead jewellery caught the attention of passers by. And the hut certainly does catch your eye. I saw joggers slow down to try to take it all in as they passed, and only a few days previously I’d cycled past myself and tried to figure out what was going on there. You should stop and take a good look – in fact you should make a special trip down there. Pick up some lovely fresh fruit and veg, buy a postcard or a new pair of earrings, and have a chat – they’re all lovely and friendly. 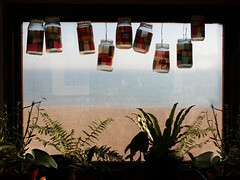 Plants as well as fruit & veg, and lovely Solent views. That’s the essence of the place – fun, friendly and varied. A place where local produce rubs shoulders with the work of local artists. What a great way to help keep the Southsea economy vibrant. Sue told me they’re always on the lookout for people who want to get involved. If you are keen to make a difference in the local community then check them out. You can get in touch via their website to find out more about the co-operative and what it means for Southsea, or check out their Facebook page. The Southsea Greenhouse, which had its official launch at the end of October, is open Wednesday to Sunday between 11am and 5pm (except on rainy days). Don’t let the autumn/winter weather put you off – it’s well worth a visit. What are you waiting for? You can't miss it! Pop in and say hello.